It is rather intriguing when a book opens with one of its main characters musing over an ‘If Else’ statement, which is the first thing every software programmer learns and then going on to say that the statement is nothing but a reflection of life. 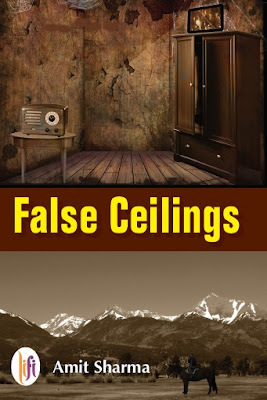 Amit Sharma, the author of False Ceilings is a software engineer, as is the character introduced to us in the first chapter. And so we assume that the book will be just like a software program; logical, straightforward, linear. False Ceilings is anything but that. False Ceilings is a Family saga that takes us back and forth between generations all bound together by blood but equally separated by their petty jealousies and insecurities. At the heart of the story is a secret, guarded almost superstitiously and passed along from generation to generation that both holds together and destroys the family. The book begins in the current period, moves briefly to an imagined future almost 50 years from the present day and then suddenly without warning transports us to the Dalhousie of pre independent India. The narration is not chronological, the story twists and turns between various time zones and locations. As you get to know one character better and sit back comfortably to discover more about him or her, Amit pulls you through a time warp and takes you to an altogether different age and location, to yet another character and story. He alternates his focus between the myriad characters, revealing a little about them then very cunningly changing tracks, leaving his readers waiting, wondering and yearning for more. Each character has his own story, each story seemingly independent in itself and yet all of them intertwined. For me, there are two things that stand out about the book. One is the non - linear narrative that the author very skillfully employs and the other is his stark exploration of the human psyche. We are almost lulled into believing that the book is all about the secret. But as it progresses you can’t help but wonder if the secret is simply a ruse. The underlying theme of the book is human relationships and their complexities. Very subtly, Amit digs deep into the human psyche to unearth and explore deep rooted emotions, fears and half-forgotten memories of the past that define each one of the characters and makes them what they are. I suppose the reason why most new authors do not attempt a Family Saga is because it is never an easy genre to write. Chronicling the lives of so many people over generations is a complex task. So it is with False Ceilings. As the book progresses and more and more characters are introduced, you might get distracted wanting to know how it all ends. However, you get the feeling that this is precisely what the author wants, to confuse us before skillfully weaving together the various stories till everything comes together like a perfectly solved jigsaw puzzle. The writing style varies between being almost nonchalant to philosophical. The prose is simple, direct and flows lucidly. There may not always be a symphony of exquisite words here but then there are no jarring notes either. Not very different perhaps from an If Else Statement! Loved this review. You said it for me Ruchira. You've penned it so beautifully that I want to read more reviews from you. Thank you so much Alka. What a lovely thing to say ! Nicely done, Ruch. I have to begin reading my copy soon. Great review Ruchira ! Being able to pull together myriad characters into a cohesive story is no easy task. False ceilings book writing is very difficult for any writer. An academic writing can be write a best book book.We should try to write like a best writer.